Some of the work being done at the Conservation Center for Art and Historic Artifacts. CCAHA is a nonprofit conservation center in Philadelphia. 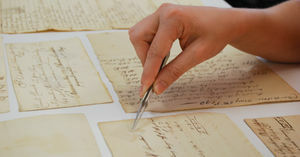 Our conservators repair and stabilize books, photographs, and documents. Our preservation staff members work in the field, helping institutions plan for the future of their collections. We work to meet our mission every day, by helping our clients share the stories of their objects, by leading large-scale preservation services initiatives, by providing subsidized collections care training across the country, by researching and field-testing the latest in conservation technology. Note: The above descriptive informaton came from the organization's About Us page. Betsy Ross' imperiled family Bible is saved by local conservation center, Philly Dot Com, February 19, 2019. This page was last edited on 19 February 2019, at 13:56.